I want a Makey Makey for remote hugs. I’m using Tom Igoe’s term “remote hugs” for paired devices that communicate a simple message at a distance. Like these adorable lamps, pillows connected to a loved one’s heartbeat, or long-distance electronic scrapbooks. A simple remotely-connected button can be amazingly emotionally expressive when the meaning is personalized by the people who use it. Even more so, I would argue, if people could make these together. Electronics tools like the Makey Makey or Bare Conductive’s new Touch Board are awesome because you can build them into something right away. You can make something personal before you get bogged down in the technical details – with paint, bananas, walls, cardboard, or your favorite materials. But you can also go deeper into the programming and electronics to make them do new things, because they are open and use a well-known, well-documented programming language. So here’s the product idea: two Arduino-compatible microcontroller boards that can transmit pin states remotely, for building custom remote-communicating devices. A voltage detected on one pin of one board (or a touch, or even just a high or low) would be sent wirelessly to an output pin on another board anywhere in the world. Transparently, no need to mess around with wireless or web protocols, just choose which two devices to pair and start tinkering right away. But of course, it’s also open and hackable so that you can tweak it for more specific purposes. The picture above is a (now slightly embarrassing!) prototype I made a while back with help from Hayes Raffle and Tico Ballagas, using a couple of Nokia Internet Tablets. It wasn’t super reliable, and the visual metaphors definitely needed work! But kids definitely had fun with it. 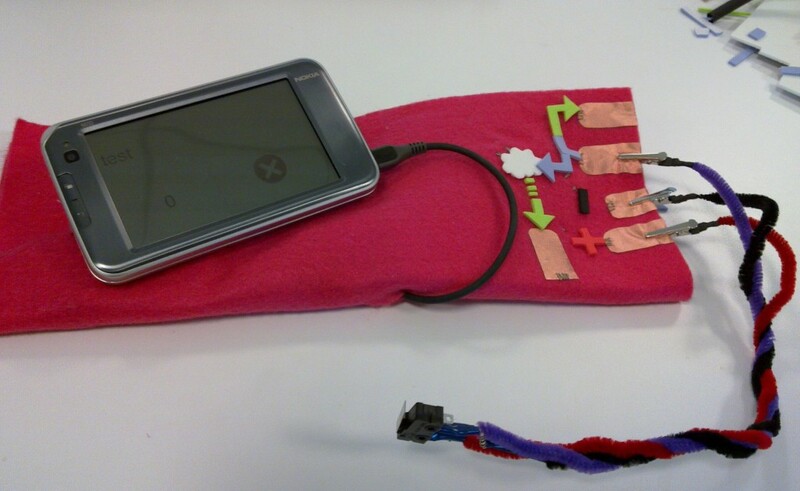 More recently I made a prototype for use with a Makey Makey using an instant messaging protocol. It needs a computer per user, but made me think that Raspberry Pis would be an inexpensive option. I got excited about the Electric Imp, and spent some time tinkering with two of them with Jie Qi, but got a bit turned off by their proprietary programming language which is a bit hard to wrap your head around. Even once we get it figured out, it won’t be very shareable because it’s another language for people to learn, and it’s tied to the company’s “cloud.” I’m now really hopeful about the Spark Core, we’ll see how those are when they come out. The hardware and software are really close to being readily available. The idea would still need a web infrastructure to handle the connections and for people to “pair” their devices with each other. Something which I just plain don’t have the bandwidth to build nor maintain, but would LOVE if someone wanted to run with the idea (*hint hint*). Lots of interesting Internet-Of-Things products coming out, but most of them seem to be about devices talking to apps or devices taking to devices in the same space. I’d love to see devices talking directly to remote devices. Anyone want to help me make this happen? Or is it out there already?